Brewing coffee manually feels like a chemistry experiment, right? To get the perfect brew, you should measure the water level carefully, monitor the temperature, weigh the right amount of coffee, and use the correct filter. But, who has the time to do this every day? Well, most of us don’t. Fortunately, a simple drip coffee machine takes your mind off these details and delivers a good brew consistently. It’s no wonder why the drip brewer has become a staple of many kitchens. Its popularity also explains the enormous variety of products in this segment. However, most of these products fall short in one or many critical criteria. So, how do you identify the best drip coffee maker for your requirement? That’s what this article is all about. By the end of this article, you will acquire the knowledge and understanding needed to confidently make the right choices. This article has two important sections. 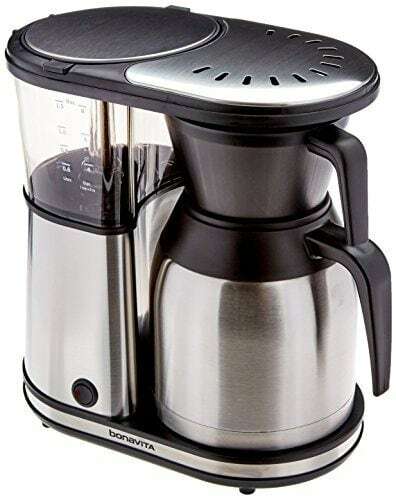 The first section contains drip coffee maker reviews that introduce you to the most impressive products on the market right now. In the section that follows, we will share important factors to consider when buying a coffee maker. On applying what you learn from the two sections, you will jump many steps closer to owning and enjoying a great machine. The BV1900TS from Bonavita is an SCAA certified home brewer. The Speciality Coffee Association of America, SCAA, tests home brewers against strict guidelines, including temperature and brewing time. Only a dozen products currently hold this certification. So, this drip brewer is designed, built, tested, and validated for optimal coffee brewing experience. We love its minimalist and compact design, ease of use, and low upkeep. The machine has only one button on it. The brewing steps outlined in the manual are easy to follow. The instructions on cleaning the coffee maker after use are easy to understand. Before buying the product, we suggest you read the manual to make sure you can follow the brewing, cleaning, and maintenance steps. The most frequent complaint people have about this product relates to the design and functionality of the carafe. The carafe keeps the coffee warm rather than hot. But, temperature preferences are subjective. If you are particular about drinking coffee when it’s piping hot, you might need a carafe with better thermal insulation. Next, the lid on the carafe makes it difficult to pour coffee when the carafe is running low. Also, the carafe accommodates 40 ounces of coffee. This is equal to five US customary cups. In the end, if you look at what matters, it’s taste. And, the BV1900TS makes delicious drip coffee. The machine also comes with a 2-year warranty cover. This is a good deal for a product in the $100 to $150 range. The NHS Velocity Brew from BUNN is one of the fastest drip brewers on the market. It’s well designed and constructed and brews good coffee. Not only that, it’s reasonably priced and comes with excellent purchase protection. Now, let’s look at the specifics of some of these advantages. The NHS Velocity brews a 50-ounce pot of coffee in three to four minutes. The hot water reservoir maintains water temperature at 200° F, which is within the ideal range for flavor extraction. Once brewed, the glass carafe keeps coffee warm for about half an hour. And, if you want to keep it warm for longer periods, you can use the thermal plate. The glass carafe has a spill-proof design. However, the machine is not without flaws. For instance, it works with only BUNN filters. Off-brand cheap filters cause leakage because they aren’t tall enough to cover the brew funnel completely. Using the wrong kind or quantity of coffee can also cause overflow. Also, the machine does not have an auto-off button. If you forget to switch it off, the water in the reservoir will evaporate and over heat. The Velocity Brew costs less than a hundred dollars and it comes with a three-year limited warranty. It stands out from other drip brewers for its speed. While there are some design issues, it performs its core function satisfactorily. So, if you’re shopping for a budget friendly and fast drip brewer that delivers good quality coffee consistently, then give this model a try. 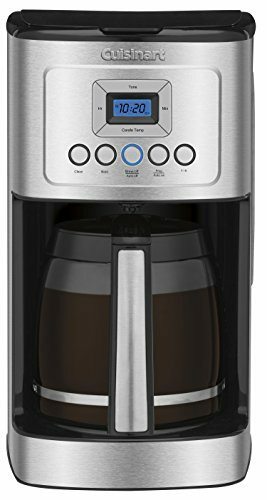 The Cuisinart DCC-3200 is one the most popular drip coffee machines on Amazon. In fact, it’s Amazon’s bestseller. So, it’s not surprising that this model has more than a thousand five star reviews. But, despite all this, why is this product third on our list? Well, that’s what we’re here to talk about. Let’s cover the positives first. The DCC-3200 brews up to 14 cups, or 70 ounces, of coffee in one go. If you’re brewing less than four cups, it has the 1-4 function for enhancing flavor when brewing less than 20 ounces of coffee. The machine comes with a permanent Gold Tone filter and a charcoal water filter. Also, the machine has an auto-start function that lets you set the time to brew coffee 24 hours in advance. Now, let’s talk about the flaws. The most glaring issue is that pouring water into the reservoir is difficult because of the lid’s awkward positioning. Another problem is that the coffee grounds overflow when brewing a full 14-cup pot. Also, the quality and feel of the parts don’t measure up to the machine’s price tag and pedigree. Considering the positives and the negatives, the DCC-3200 is a good choice for the price. However, if you stretch your budget a little, you can easily buy a more reliable machine. 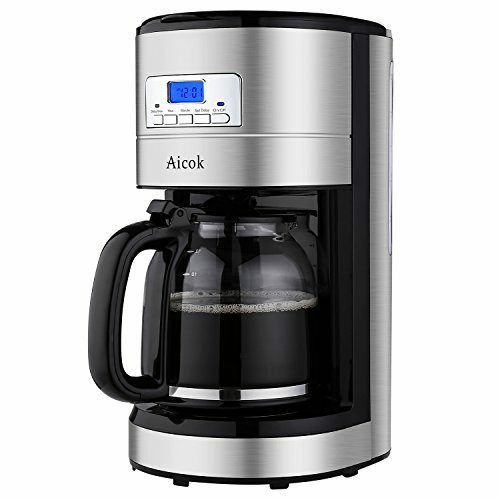 The Aicok 12 Cup Coffee Maker is worth your consideration because it offers a lot of features for a low price. In fact, its features closely match the features of the DC-3200, which is a bestseller on Amazon. But, Aicok is a new brand and does not exude much credibility. Now, about those features. 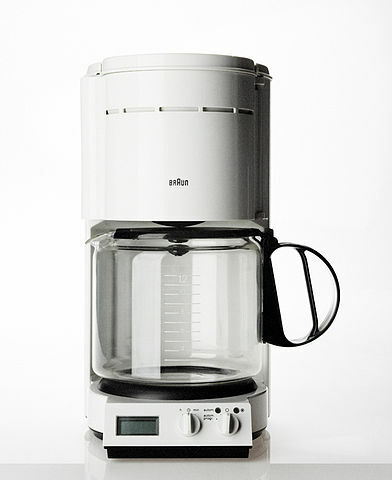 As the name suggests, this coffee maker has a high capacity carafe, which accommodates up to 60 ounces of coffee. It has a programmable auto-start function. And, it comes with a thermal heater that keeps the carafe warm for 45 minutes, before automatically shutting down. It also includes a permanent mesh filter. Well, so far so good. But, customers have reported a few issues regarding the machine’s durability and performance. The worst part is that the company does not have a well-established network of service centers or the necessary customer support to address customer queries and complaints. In a way, the Aicok’s attempt to inflate the value of the product by increasing features did not pay off. But, they did get the pricing right. For a product that is this cheap, the risk to reward ratio isn’t high. So, if you’re looking for a temporary or makeshift drip coffee machine, the Aicok 12-cup model will fit the bill. Black & Decker DCM600B is a mini drip coffee maker. It weighs less than a pound and takes very little counter space. And, it costs less than $20. Not only that, it’s got over a thousand five-star reviews on Amazon. So, let’s look at why this bite-sized model is this popular. The DCM600B can brew up to 5 cups, or 25 ounces, of coffee in one go. Although this capacity is not ideal for a family, it’s perfect for single or dual occupancy apartments and dorm rooms. The unit is also extremely portable. So, you can take it along with you without any issues. The machine is also very easy to use and maintain. When you’re not using the coffee maker, you can use the machine’s cord storage to secure the cord. This is another great feature for machines in confined spaces. This machine also has a removable filter and a hot plate. Plus, it comes with a 2-year warranty. In summary, this machine is cheap and does what it advertises. It’s of special significance for people who appreciate its compactness and portability. If you’re looking for a drip coffee machine strictly for individual use, this would be the ideal choice. Coffee machines range from relatively inexpensive drip coffee machines to super-automatic machines that cost thousands of dollars. In perspective, the drip coffee machine is not a high-budget product. However, within drip coffee machines, you will find products at prices ranging from $20 to hundreds of dollars. So, spending your money wisely requires an element of planning. In this part of the guide, we will address those elements. First, we will discuss what to expect from a drip coffee machine. Then, we will share insights on factors to consider when buying a drip coffee machine. In the end, we will point you to some popular brands in this segment so that you can do your own research and extend your options beyond the products mentioned here. At the end of reading this section, you will have the information needed to identify, buy, and enjoy a drip coffee machine that’s perfect for your requirement. So, let’s begin. Do I need a drip coffee machine? A drip coffee machine is the easiest coffee machine to use. It’s also the most affordable type of coffee brewer. At the same time, such machines are very limited in its function. For instance, semi-automatic commercial espresso machines allow you to control brewing variables, such as grind texture, dosing, infusion time, and temperature. These advanced machines grant moderate to complete control over the brewing process. Such features enhance the flavor of coffee to a degree far beyond a normal drip coffee machine can. Bottom line – drip machines don’t make the tastiest coffee. That said, not everyone has the time to pursue the art of fine brewing. Also, many people don’t have a budget high enough to afford these machines. It is for this category of people that drip coffee machines exist. In other words, a drip coffee machine is the best option for you if you are on a conservative budget and enjoy simplicity. Also, brewing coffee on a drip machine is easier, cleaner, and faster than brewing coffee manually. The taste is consistent, too. What are the important factors I should consider when buying a drip coffee machine? Temperature: The ideal range of water temperature for flavor extraction is between 195° F and 205° F. When you’re shopping for a drip brewer, make a note of machines that maintain the temperature within this range. High-Capacity Carafe: A high-capacity carafe allows you to brew coffee for the entire family in one go. Usually, the makers advertise capacity in five-ounce cups. However, the customary US cup measures eight ounces. So, the number of cups you actually get from the machine is less than the advertised number. Thermal Insulated Carafe: Once you brew a whole pot of coffee and pour it into the carafe, the coffee begins to cool. Most plastic, glass, or metal carafes keep the coffee hot for 15 to 30 minutes. A thermal insulated carafe, however, can keep the coffee hot for as long as two hours. Hot Plate: Many drip coffee makers have a built-in hot plate. You can use this to keep your coffee warm. But, if the plate gets too hot, it will burn the coffee. Also, using the hot plate to keep coffee warm increases energy consumption. Filter Basket: The filter basket may hold a permanent filter, one-use paper filters, or both. A good filter provides clear coffee. However, if you choose an incompatible filter and use inappropriate dosing, the coffee grounds will overflow. So, make sure you understand the type of filter that works best for a machine. Shower head: The shower head is the part of the machine that spreads the water over the coffee grounds. A good drip coffee machine has a shower head that spreads the water evenly instead of concentrating the spray at the center. Construction: Since drip coffee machines are low-cost products, they generally have a cheap plastic feel. However, there are a few machines that are robust. The only issue is that you can’t judge the quality of the parts from pictures. You should get a hands-on feel for the product. Cleaning: To keep the performance and taste consistent over time, you should follow the daily, weekly, monthly, and quarterly cleaning and maintenance tasks the way the manual describes. So, read the product’s manual to go through the process and see whether they are easy to follow. Warranty: Even people who handle their products with great care fall prey to issues resulting from material or workmanship defects. If something like this happens, a user-first warranty policy helps you fix the damage without financial loss. So, read the product’s warranty policy to see whether it is user-friendly. Service: An active customer support system and a wide service network are definite advantages. Before you buy a product, you should research the nearest location where you can get that product fixed. In fact, we recommend you visit the center to see a live demonstration of the product. In addition to the above requirements, you can consider aspects such as size, aesthetic appeal, power consumption, and portability. Also, we strongly recommend buying a coffee grinder to go along with the drip coffee machine. Freshly ground beans produce more flavorful coffee than pre-grounds do. Even a mid-tier drip brewer can make great coffee if you have an excellent grinder. Wow! I need a drip brewer. What are my options? In the previous section, we have included a list of top 5 drip coffee machines. Please revisit the list to see whether any products there match your requirements. If you find a product you like, most likely you will, you can proceed with the purchase. This is the best case scenario. But, in case you don’t find any of the products suitable to your taste, you can explore products from BUNN, Bonavita, and Cuisinart to widen your choices. Before we conclude the article, here’s a quick recap of the reviews of drip coffee makers. For a $100 budget, the Bonavita BV1900TS and the BUNN Velocity are the top products to consider. The BV1900TS is an SCAA certified brewer that makes excellent coffee. 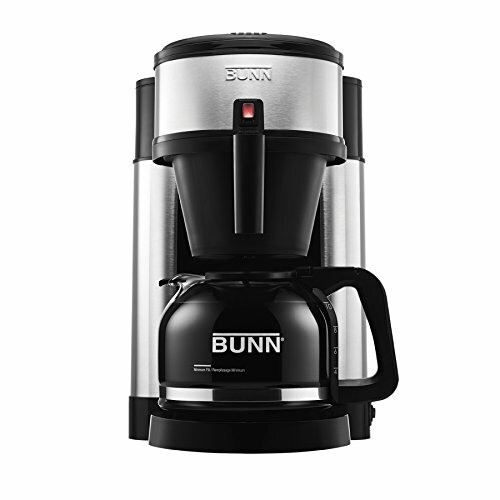 The BUNN Velocity shines for its speed. Within the $50 to $100 price range, you can get the Cuisinart DC-3200 if you like the auto-start function. 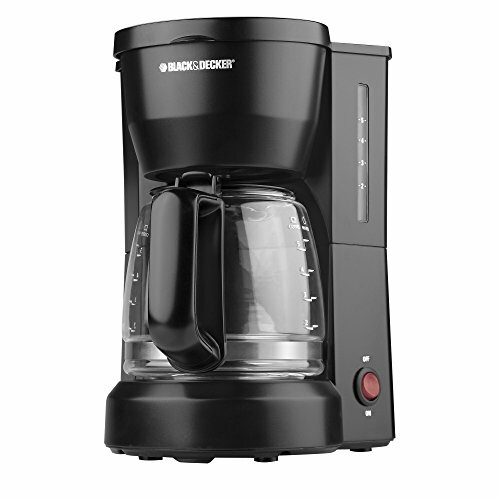 And, if you’re looking for something really cheap, the Black & Decker 5-Cup brewer is a compact and portable choice. Today, drip coffee makers come at many prices. They also come with a varied mix of capabilities and limitations. Fortunately, you have this guide to objectively compare the advantages and disadvantages of the products. And, this knowledge will serve you well in uniting you with your dream drip coffee maker.